Designed by award-winning architect Wayne Windham, 32 Rhett’s Bluff Road is a classic Lowcountry style home nestled among live oaks at the edge of a tidal marsh and river. The home was originally built in 1994 by Koenig Construction but has been updated to reflect today’s modern lifestyles. 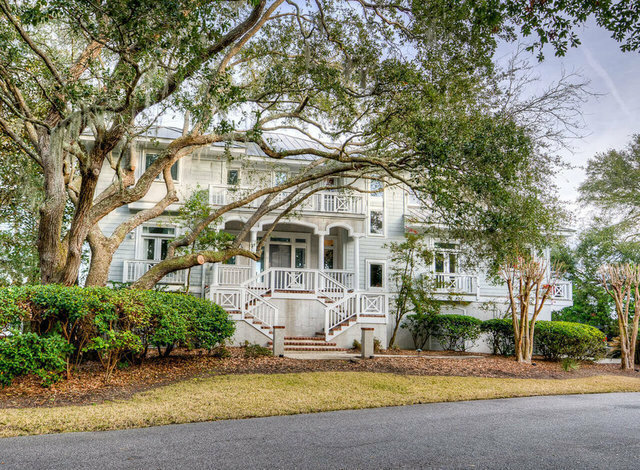 The property is an absolute retreat in one of the most desirable and established neighborhoods on the Island and offers unparalleled access to the scenic and navigable Kiawah River, Shoolbred Creek, and the Atlantic Ocean. The home offers beautiful curb appeal with a welcoming front entrance with a double staircase, porch, and second story balcony. Decorative railings accent the front entrance, as well as the impressive wrap-around porches on the back of the house. Once inside, a muted palette of natural and coastal tones allows for the all-encompassing river views to be the focal point throughout the open floor plan. The great room is outfitted with a gas fireplace with built-in shelves and cabinetry, thick crown molding, exquisite hardwood floors, and a window seat that overlooks the river. Wall-to-wall windows, sliding glass doors, and tray ceilings maximize the natural light within the space. The traditional kitchen is warm and inviting with tile floors, custom wood cabinets that provide ample storage and organization, a built-in desk area, and a large center island with a granite countertop and wine rack. Family and friends will enjoy meals together at the breakfast bar and in the dining area. Nearly all of the rooms on both the main and second floors of 32 Rhett’s Bluff, including the sleeping spaces, offer access to the outdoor living areas. An expansive back deck runs the length of the home and overlooks the private dock, complete with a floating dock and boat ramp. A screened porch with a domed ceiling is the ideal spot to enjoy the sun setting over the relaxing river waters. Upstairs, a cozy reading nook is located at the top of the stairs. All three guest rooms, including one on the first floor, are bright and cheerful, offering incredible views for visitors and private bathrooms. The master suite is generous in size and has built-in shelves and cabinets, plus tons of natural light and endless views. The master bath is spacious and has a marble vanity with dual sinks, a walk-in shower, and soaking tub. Additional highlights of the home include a den or study on the first floor, an elevator, and a large storage area underneath the house, perfect for boating equipment, water toys, and bicycles. This home is available with a Kiawah Island Club Sports Membership.